Will Dental Implants Help In Gum Disease And Bone Loss? Dental implants replacements for natural teeth when they fall off for various reasons. They look nearly like natural teeth, which allow you to eat properly, smile beautifully, laugh as much as you want, and talk as much as you want without any fear or embarrassment. Just as you would do with healthy teeth. They look natural and work also like natural teeth, adding to your self-confidence and positive self-image. 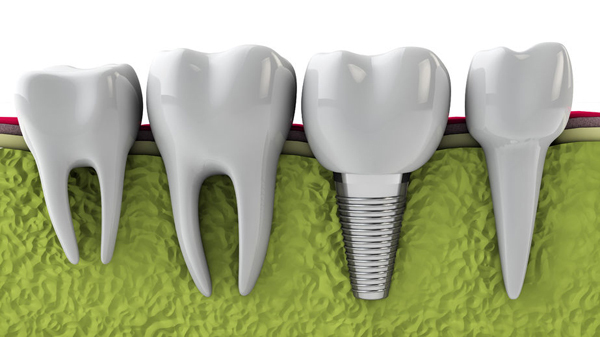 Dental implants are artificial tooth roots which look like screws. The dental implants are placed in the jawbones and bone tissue then grows around these implants. The jaw bone gets itself bonded with the implant and within around six months they are fully integrated with each other. After the full bonding, this implant becomes the base for crowns to be fitted on top of it. Dental implants are used for giving the person a replacement for lost teeth. It is also a restorative treatment for jaw disease and bone loss, because it actually helps bone growth by the process of osseointegration, where the bone re-grows around the implant making it firmly embedded in the jaw. Gum disease is the leading cause of tooth loss in adults. It can be either a simple gum inflammation or even more serious diseases that results in soft tissue and bone damage. Gum disease are also referred to as periodontal diseases. Inflammation around teeth is a disease called periodontitis, which is an advanced state of periodontal disease. Here, the gums are pulling back from the teeth which results in creation of small pockets of space. The bacteria settle in these pockets and make these spaces infected. Due to infection, the person gets severe pain in the tooth and experiences extreme chewing problems. The teeth then slowly get loosened and fall off. When the empty place of the fallen tooth does not filled up with a replacement, and go untreated, it further complicates the problem. These problems are very common among adults of above age 30. It is estimated that it quite widespread affecting millions in Australia and many times more in other less advanced countries. The number one cause of gum disease is poor oral hygiene. Our mouth is full of bacteria. We take in bacteria from our environment all the time. These bacteria works well if given food for it to thrive. These bacteria form a thin colourless film in our mouth called plaque. When we brush our teeth, the plaque is removed. When we floss our teeth we remove food and film from between our teeth. Lack of brushing and flossing help this film to grow and with continued poor oral hygiene this thin film hardens and turns into tartar which is difficult to remove only by brushing or flossing. If tartar has formed on and around your teeth, only a dental professional can remove it. This can then lead to serious gum problems. Gums have tissues that hold our teeth in place. The gums become diseased when these tissues get infected because of tartar which helps bacteria to breed and slowly eat away at the gum tissues. When tissues of jaw bones get infected, the teeth loosen and slowly fall of. Bone loss occurs in the area that surrounds the tooth which was supported by the bone, called alveolar bone. The ridges between teeth is formed by alveolar bone. When there is no bone to support, the bone shrinks and gets resorbed. The bone remains in place only when it receives pressure from chewing food by teeth. When there is no pressure because there are no teeth, the bone gets resorbed in the body. It is believed that 25% of jaw bone is lost in the very first year after lost tooth. Even after fitting dentures in full, or partially, the pressure exerted on the gums is not significant, as low as 10% of natural teeth. When upper back molars are removed, the sinus cavity expands and because there are no teeth, the extra pressure on gums initiates resorption of the bone into sinus cavity. This problem also can be corrected with dental implants. Whenever you lose a tooth or many teeth, the best way of treatment is dental implants, as they are almost a permanent solution to the problem because they fuse with the jawbone called osseointegration. As a result, dental implants can support number of crowns which will act as natural teeth, doing all the jobs of your natural teeth are supposed to do. Because they look like natural teeth, they work better than dentures. They can be customised based on the requirement of the individuals, like colour, shape, and size. They provide the stimulation to jawbone so as to prevent the jawbone from further deterioration. Dental implants also help in correcting any other irregularity of the teeth and mouth. For example, a hybrid procedure can also be used where a lot of bone loss has occurred. For such patients a set of teeth is made and attach them to gum like base. This set than is secured on the jaws by several dental implants, which are required for stability. This and many other options offer a wide variety of solutions even for the patients who have suffered a great deal of resorption of jaw bone. They are wonderful for gums also as they do not increase the risk of gum disease or decay.